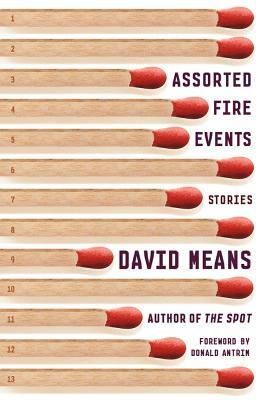 Upon its publication, Assorted Fire Events won a Los Angeles Times Book Prize, was nominated for a National Book Critics Circle Award, and received tremendous critical praise. Ranging across America, taking in a breathtaking array of voices and experiences, this story collection now stands as one of the finest of our time. David Means was born and raised in Michigan. His second collection of stories, Assorted Fire Events, earned the Los Angles Times Book Prize for fiction and a National Book Critics Circle nomination. His third book, The Secret Goldfish, received widespread critical acclaim and was shortlisted for the Frank O’Connor International Short Story Prize. His fourth book, The Spot, was selected as a 2010 Notable Book by The New York Times, and won an O. Henry Prize. His books have been translated into eight languages, and his fiction has appeared The New Yorker, Harper’s Magazine, Esquire, Zoetrope, The Best American Short Stories, The Best American Mystery Stories, The O. Henry Prize Stories, and numerous other publications. He lives in Nyack, New York, and teaches at Vassar College.